Radiosonde observations provide the condition of the atmosphere above the launch site (typically within 25 miles/40 km) at the time of launch. While they do not provide any direct forecast information, they do help explain why we experience different types of weather. 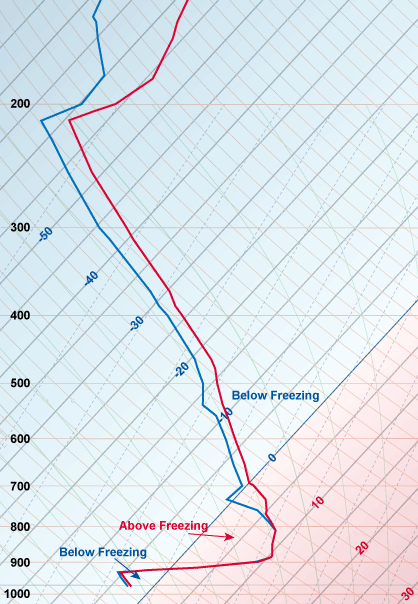 Following sample soundings are typical for different weather conditions. 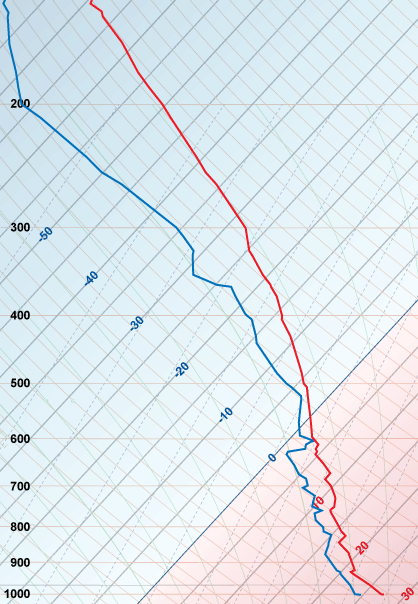 The atmosphere is very moist as indicated by the small amount of separation between the air temperature (red line) and the dew point (blue line). 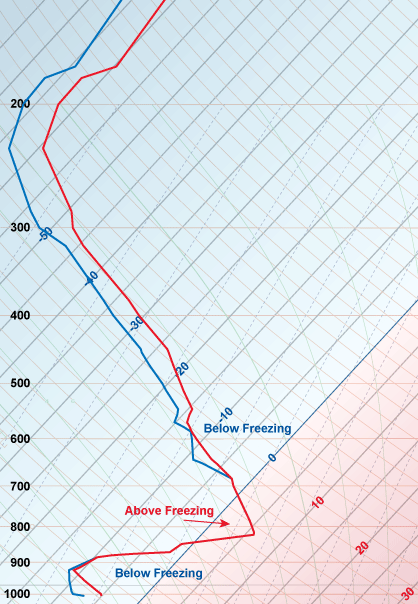 Even though the air temperature increases a few hundred feet above the ground (a temperature inversion) the air temperature, throughout the entire atmosphere, remains below freezing. So, when precipitation begins, it will be in the form of snow and will remain frozen as snowflakes reaching the ground. 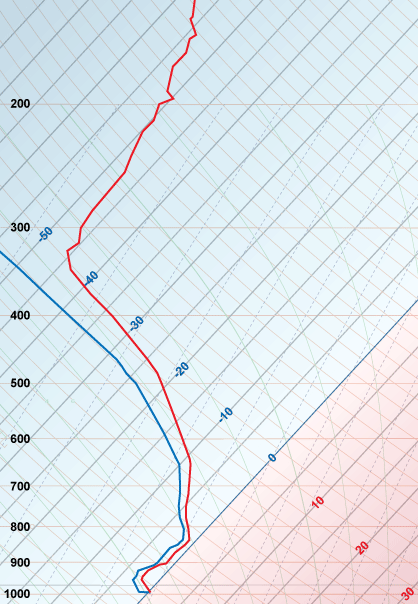 As with the previous sounding, the atmosphere is very moist. So much so, the air temperature and dew point are the same from near 900 millibars (3,000 ft. / 1,000 m) to a little above 700 millibars (10,000 ft. / 3,000 m). At the surface, an arctic cold front had moved south of the observation station with an air temperature well below freezing. The air temperature begins to decrease with height (which is normal) dropping from 23°F to 12°F (-5°C to -11°C). However, the density of the arctic air is such that it lays close to the ground with its vertical extent fairly small, in this case only about 3,000 feet (1,000 meters) deep. Above 900 millibars (3,000 ft. / 1,000 m) the air becomes considerably warmer. This area is called an inversion, where temperature change with height is 'inverted' as it increases with height instead of typically decreasing with height. This inversion is often also referred as a 'warm nose'. Eventually, the temperature of the atmosphere will return to the typical decrease with height (near 800 mb) and will continue to cool until it falls to below freezing again (about 720 mb). While there may be some precipitation forming as rain in the warm 'nose' region where the air temperature is above freezing, the vast majority of precipitation will form as snow in the colder below freezing air above the inversion. As snow falls into the 'warm nose', it melts into a liquid drop/rain. Then the liquid drops fall back into the arctic air mass (near the ground) that is cold enough and deep enough for the liquid to freeze into ice pellets before reaching the ground. A typical "Freezing Rain" sounding. The basic pattern for freezing rain is similar to ice pellets. The main difference is the cold, dense air near the surface is very shallow and/or the 'warm nose' is large or very warm or both. The melted snow does not have sufficient time to freeze before is reaches the ground. Therefore, precipitation falls as rain but then it freezes upon contact with a surface such as a tree, power line, automobile or bridge. As a general rule, elevated surfaces will ice first because the ground cannot keep them warm, allowing them to cool to the air temperature quickly. This allows the rain to freeze to ice on contact with these surfaces. Elevated surfaces may be capable of accumulating ice as soon as the air temperature falls below 32°F (0°C). Road surfaces in contact with the ground will generally begin to ice when the air temperature falls to 28°F (-2°C). A typical "Tropical Storm/Hurricane" sounding. Inside hurricanes, the velocity of the air helps keep the air mixed. Therefore, other than the normal decrease with height, variations in temperature (and dew point) are fairly minimal.